Another good book about human denial and illogical behavior. Please read it and share it with friends. Learn about how you think. The more facts that pile up about global warming, the greater the resistance to them grows, making it harder to enact measures to reduce greenhouse gas emissions and prepare communities for the inevitable change ahead. It is a catch-22 that starts, says psychologist and economist Per Espen Stoknes, from an inadequate understanding of the way most humans think, act, and live in the world around them. With dozens of examples—from the private sector to government agencies—Stoknes shows how to retell the story of climate change and, at the same time, create positive, meaningful actions that can be supported even by deniers. 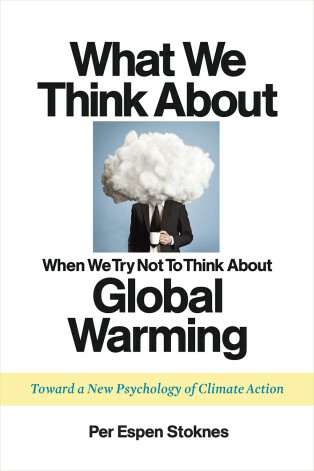 In What We Think About When We Try Not to Think About Global Warming, Stoknes not only masterfully identifies the five main psychological barriers to climate action, but addresses them with five strategies for how to talk about global warming in a way that creates action and solutions, not further inaction and despair. These strategies work with, rather than against, human nature. They are social, positive, and simple—making climate-friendly behaviors easy and convenient. They are also story-based, to help add meaning and create community, and include the use of signals, or indicators, to gauge feedback and be constantly responsive. Whether you are working on the front lines of the climate issue, immersed in the science, trying to make policy or educate the public, or just an average person trying to make sense of the cognitive dissonance or grapple with frustration over this looming issue, What We Think About When We Try Not to Think About Global Warming moves beyond the psychological barriers that block progress and opens new doorways to social and personal transformation. "We Are Nature Protecting Itself"